Milly-Molly-Mandy lives in a “nice white cottage with a thatched roof” along with her father, mother, aunt, uncle, and grandparents. They have a small farm and Milly-Molly-Mandy gets to ride to market with her grandfather in the pony and trap, paddle in the brook, keep a little yellow duckling, and grow a pumpkin in her own vegetable patch. She also has two friends, called Susan and Billy Blunt, and together they sleep outside in tents made from sheets and kitchen chairs, learn to cycle on two old bicycles, and make a little house together in a tree. The Milly-Molly-Mandy stories were written and illustrated by Joyce Lankester Brisley who was born in Bexhill, England in 1896. Most of the Milly-Molly-Mandy stories were first published in the Christian Science Monitor, and then collected into three volumes: Milly-Molly-Mandy Stories (1928), More of Milly-Molly-Mandy (1929) and Further Doings of Milly-Molly-Mandy (1932). 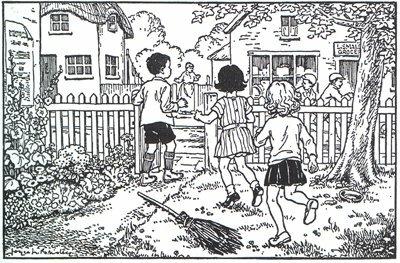 A fourth volume of stories, Milly-Molly-Mandy Again was published in 1948. 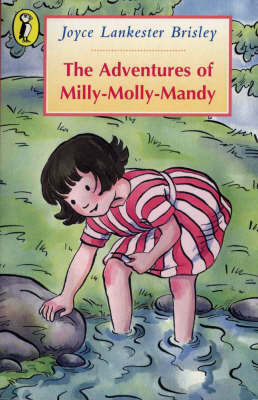 In 1992, Puffin published the four books together in a single volume titled The Adventures Of Milly-Molly-Mandy. We have The Adventures Of Milly-Molly-Mandy in the fiction section of our library. Upper Hutt Public Library has five Milly-Molly-Mandy titles and one audio book in the Children's section. Most of the above information was obtained or adapted from: here, here and here. Great blog Mrs Keane! I loved this book when I was growing up! Best of all this is a recommendation from the book club aka the coolest club at school.